On this day in 1994 Crayon played a house party in Ann Arbor, Michigan. 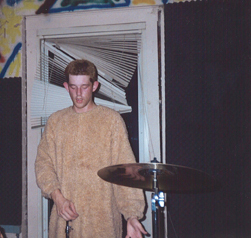 I don’t remember this show very well, but I’m sure Jeff wore the lion suit and I’m betting Brad’s guitar was too loud. Today we have Secret Goldfish by Crayon. Yes to the Lion suit!